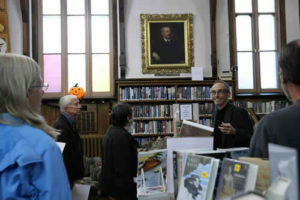 All residents of the communities from which Hubbard Free Library receives partial funding – currently Hallowell – are entitled to a free library card. Residents of other communities may obtain a card with a payment of $40 a year. Persons who reside outside the above communities, but have tax-paying businesses in them, may also have a free card. Summer residents must pay the full $40, but if all items are returned at the end of the summer, one-half of the fee ($20) will be returned. To obtain a card, we ask for some proof of residence – e.g., driver’s license, a bill or letter sent to your home address. Children under 16 must have a parent or guardian sign their application card. Library cards do not expire (as long as the library is receiving funding from the town of residence), but an annual expiration date in our automated system will enable us to check that all contact information is current, when it comes up. All materials go out for two weeks. Books, Audio Books, Music CDS and Cassettes, and Magazines may be renewed twice, unless the item has been requested by someone else. Videos and DVDs may be renewed once. Renewals can be done in person, over the phone, via email, or through this web site. After two renewals materials must be returned to the library, but may be checked back out again, if no one has requested them. Videos/DVDs: $0.50 a day, $10 maximum. Books, Audiobooks, Music CDs, Periodicals: $0.05 cents a day, $10 maximum. When calculating overdue fines, only days we are open will be counted. If items are not returned at all, the cost of replacement will be added to the patron’s record, and borrowing privileges will be suspended until payment is made. Note that in the case of minors, parents will be held responsible (as indicated on the card application which they sign), and a hold may also be put against their records.